Getting a novel off the ground. I don’t care what anyone says, every artist wants to be a star, whether co-or overtly. Yes, there are times when all of us create in secret; authors have been known to write books solely for themselves (Marcus Aurelius’ meditations), artists paint pictures they hide in basements (The painters of Burma), budding rock stars close the curtains and croon furtively into hairbrushes. But let’s face it, art is about the expression of ideas, and if you’re expressing, you’re usually expecting an audience. Even the hiding of art (unless for political reasons) is about the audience, and the fear of its often acerbic feedback. The exhibitionist and the introvert are both in the thrall of other people's opinions. Many will fervently deny it, yet no matter how modest a varnish we smear over it, we all covet celebrity, even if we simultaneously fear it. But because we suppress it (just watch the futile attempts of any artist to surreptitiously quell their inflation at the mention of their work) the vanity grows in the dark. Like a banished ‘barmy’ family member, it sits in our proverbial basements gorging on our craving for approval, until it’s so horrendously obese it’s sabotaging not only what we actually create, but our means of promoting it. It’s often painful to watch artists try to promote themselves, and even more painful to be the artist. Art exhibitions and book launches are one of the only chances a new indie artist has to put themselves out there, and nerve-rackingly difficult to succeed at. We all know that promotion requires a significant budget, and the larger the budget the better your chances. It’s a risk for a small artist to lay on a large-scale event, and unless you are very well connected then the chances of ‘failure’ (i.e. four people turning up) are high. And it’s here that our banished great aunt Vanity is doing us no favours at all. Either she's so desperate to be the star of the show, her great wobbling bulk blocks our view to more effective promotion strategies, or she's so mercilessly repressed that promotion is nigh impossible. Thankfully, as of last week, I have been introduced to a new approach to book launches that works for both extroverts and introverts, and pretty much guarantees success. I was lucky. 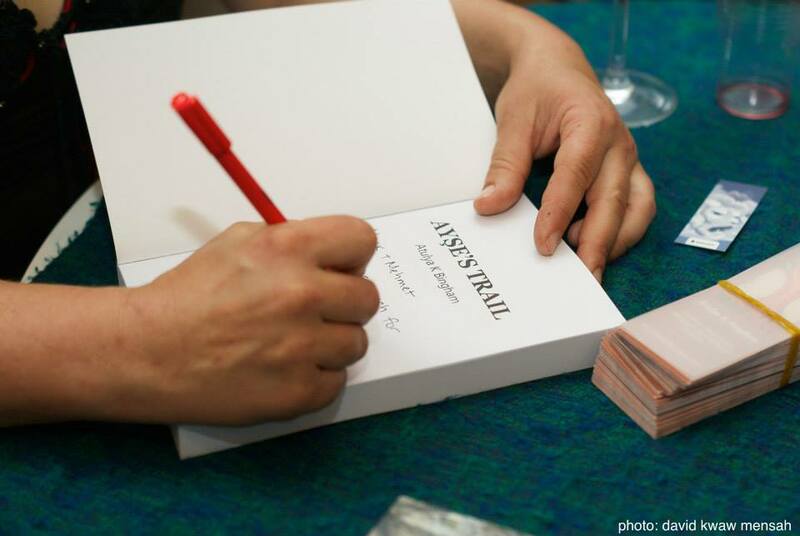 My novel, Ayse’s Trail, was shortlisted with 9 others to take part in a book launch organised by Literally PR and the publisher Completely Novel in London last month. And it was an excellent demonstration of how a book launch should be done. For starters, rather than being gripped with terror at the prospect of a potentially empty house, I wallowed in every minute of the launch, because it was an event rather than a hideous, desperate promotion push. The 10 authors who launched spanned roughly 10 genres; from fantasy novels to young adults and children’s books. Yes, it did make a difference that all the novels were hand-picked. The quality of the books, the speeches, and a large audience of literature enthusiasts, book magazines and scouts most certainly helped create a book launch that had the air of a literary event. But this wasn’t the most important thing I derived from the night. Because I learned something. And I love it when that happens. There was a friendly sense of collaboration among authors, friends and the organisers. And it dawned on me there and then, the obvious way to launch books, or art, is not single-handedly. Those that know me, know I’m something of a Lone Ranger- DIY-one-woman-show kind of a girl. And yes, there’s a time and a place for independence, but your book launch isn’t one of them. Collaboration is the key. The expense is divided and the audience is multiplied. You’re not teetering lonesome and vulnerable on your perch. You’re a crowd, a crowd of people for whom the expression of ideas in aesthetic ways is an intrinsic part of life. It’s as clear as day. We need to work together. So it is that I’ve decided to launch Ayse’s Trail a second time, not least because I'm rather getting in the swing of it. This one will be in the home of Ayse. Istanbul here I come. The 10 authors selected for Completely Novel's One Big Book Launch: Sabrina Mahfouz, Tracy Elner, David Zen, Catherine Bruton, J.Paul Hendersen, Simon Fairbanks, Angie Morgan, Julia Johnston, Judy Jackson and Atulya K Bingham.